Been really frustrated with that because it doesn't trip all the time, but when it does, it's when I haven't save my work. Some times I get so frustrated I just decide to throw my hands in the air and say "FTS, I'm just gonna read a book". But after watching this video, I think I can consider buying this book. I think it's brilliant how they brought out the strong points of this product in that video, even the fact that the battery doesn't run out fast. =p No need to look for a charging point everywhere you go. Wooohooo. The Ultrabook™. Inspired by Intel. is Ultraportable as shown in the vid by Vernon, the geeky looking assistant of Tiësto. He brought it everywhere he went and made video calls, so it's detachable, unlike the big laptop, or worse, a desktop that needs to be hooked to a powerplug. That, plus the fact that it's touch centric is nice. No need to bring a mouse around. Really excited that Nuffnang is giving Nuffnangers a chance to try it out at the Acer & Intel "PLAYsure" Redefined party!! Touch all parts of the screen!!! 3.5 years ago, I spent the eve of Christmas and the first half of Christmas on 2 planes in 3 airports. The second time I used this passport (2 stamps on top), I had a really exciting time while still in the airport. After that I never went other than going from Butterworth to Penang Island. 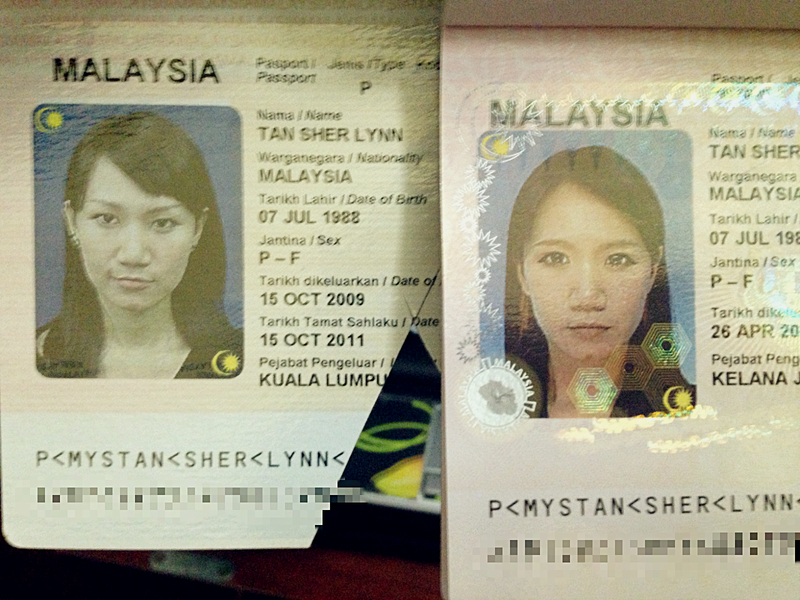 But I've decided to renew my passport again. With the power of money vested in me, I give thee a chance to live for 5 years. Ok la so I had to go to the immigration office to do that. I did a lot of research on passport renewal before going because I didn't want to mess up and had to take another day off to go again. Few days before I went over, my colleagues went to renew theirs and they encountered problems from the immigration side, so I wished really hard to the third star north west to the moon to grant me a smooth sailing passport renewal trip. and it's a government department, so they'll probably stop quite long for lunch and prayers. But I don't see a better day in the future to do it, and just went ahead. I reached the Kelana Jaya branch, located in Plaza Gomac at this time. I went in and asked the officer standing at the counter next to the door and he was really polite and helpful. I'm not sure if they accept the pictures you bring, but I think it would be safer to take the pictures there. It was RM10 for 4 pictures, those photo booths, and if you don't like the first 1, you have 3 tries in total. The abang was nice la so it was all easy peasy. I went to the machine and there was only 1 person before me who was already at it. The machine is at the left side of the office behind a glass wall, don't need to take a number for it. Just stand in line and wait for your turn. so don't worry about not knowing how to use. There's a lady inside monitoring your screen as well so it'll be fine. I had RM10 notes, so I went to the photo booth and asked the man to change it with me. He was really helpful. He asked me to go to Counter 3, and the lady there gave me a RM100 note in exchange for my RM10. After that I went back to the machine and repeated the procedure. Finally did all the things, gave the picture to the lady in the office next to the machine and voila! The wait is on. It was supposed to take 1 hour, but their system was down and I had to wait 2. Not too bad. I stayed there for 2 hours and read half a book. By this time I have collected my passport and was on the way to my car. The changes in 3 years is crazy. Your IC. Just the original for the machine. A few hours of patience. Don't hesitate to ask the help of the people there. If you're friendly, they're friendly too. If you need more infor, just drop a comment. Some immigration offices are open on Saturdays too! !